In the fall of 1993, when I moved to northwest Michigan, Poppycocks was the only decent place to eat on Traverse City’s Front Street. The city had plenty of surface parking lots where buildings once stood, a delapidated State Theatre on Front Street, and a ghostly 100-year-old psychiatric asylum on its western boundary. On the sprawling outskirts, the Grand Traverse Mall had just opened and the South Airport ring road at the mall’s doorstep was so fry pit-ugly and congested that it was a metaphor for what people feared the city and region would eventually become. Traverse City is a much different place today. New homes and office buildings are replacing the parking lots. Front Street is host to bars and restaurants and coffee shops and specialty food stores too numerous to name. The state hospital, where one of the largest historic restoration projects in the United States is under way, is being turned into a mixed-use village of homes, shops, and offices. To be sure, the mall is thriving and South Airport Road is busier than ever. But citizens and non-profit groups, including the one I work for, killed the highway bypass and bridge that would have been the next junked-up ring road, and replaced it with a federally-financed plan to make sure we are smarter about how to use our natural assets. Traverse City, in other words, has stepped across an economic and cultural threshold. The distinctive ingredients of neighborhood, history, geography, and good taste are being mixed in very new ways. Perhaps none of the many events that now mark the city’s busy calendar reflects this new era more than the Traverse City Film Festival, which ended tonight. Moore’s comments struck me as intensely personal. 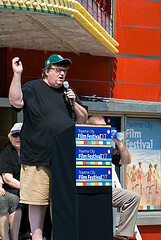 I don’t know Michael Moore and only met him once when he spoke a decade or so ago at the annual awards meeting of the Northern Michigan Environmental Action Council. But an ambitous 53-year-old man who’s used his brain, mouth, and story-telling skills to become a genuinely influential figure of his time also needs a place to feel safe. In Traverse City he found that and more. “Just great films” is an apt summary for why the festival is so successful. Moore’s knack for choosing movies that are funny, provocative, intelligent, and tell great stories is almost flawless. “Just great films,” though, also says just as much about Moore’s needs. It’s a not so subtle reminder that in Traverse City, Moore isn’t interested in being the national figure, the activist pushing back against an inept president, an unfair system, and his critics, as he did on CNN last month. He has no desire to roil the political waters here and does not want to be a pariah in his new community. But make no mistake. This is an ambitous Academy Award-winning director who likes to make a point. With the help of two well-known and well-liked local guys– author Doug Stanton (“In Harm’s Way,” Owl Books, 2003) and photographer John Robert Williams — Moore crafted a week-long film experience that fits its place; a city of stable neighborhoods, hard working entrepreneurs, and welcome optimism. The Traverse City Film Festival is a prominent statement about what it takes for a newcomer, a developer if you will, to build something enduring that people love instead of fear. The three men accomplished this trick by using the civic resources at hand. The film festival’s venues are a restored city opera house, an existing community playhouse, an auditorium in a neighborhood school, and the partially restored State Theater downtown, which hadn’t shown a movie in years. 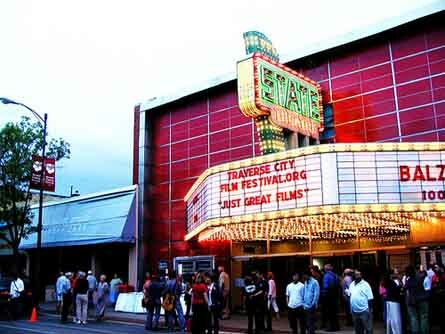 By deploying existing assets to show 63 films in 98 screenings to a collective audience of 80,000 viewers this year, the festival strengthened Traverse City, not weakened it. How rare that is in a fast-growing region contending with out-of-scale, out-of-context, community-disfiguring development that makes people here flinch, whether it’s the $600 million Bay Harbor gated community south of Petoskey, the billion-dollar-plus proposals for new coal-fired electrical generating stations in Midland and Rogers City, or the monster amusement park that a developer wants to cut from state forest land in Grayling. Two other essential ingredients also were mixed into the festival’s successful formula — civility and volunteers. Moore and his colleagues appear intent on instilling a heartland culture that displays no interest in attracting the glitz and glamor and publicity of better-known film festivals. For the moment, and hopefully for many years to come, the Traverse City Film Festival will continue to be as courteous and approachable as its famous principal founder. Lastly, the film festival operates with the financial help of dozens of local sponsors and roughly 1,100 volunteers. Nothing is more valuable than a person’s time. In a city of 14,300 residents, a volunteer swarm that size indicates that people find tremendous merit in this new and evolving community event. I was one of the volunteers. It was a really good time with great movies and fun people. The festival’s sole purpose was to have a good time while watching movies. The films came from around the world, bringing in diverse viewpoints and cultures. From what I understand the TC library will have copies off all the films shown at the festival. Your post is a lovely tribute to Traverse City, MI and all that it has to offer its citizens and folks who just dream about living Up North. We participated in the Traverse City Film Fest in a small way and found that the tireless volunteer staff produced a world-class event, organized smartly and efficiently. Specifically, the Opening Night Party was a wonderful collaboration by several wineries, restaurants, designers, florists and logistics companies. A parking lot transformed into a festive likeness of Grauman’s Chinese Theater. And I expect that the busy Traverse City calendar will support your comments with further evidence of “distinctive ingredients of neighborhood, history, geography, and good taste.” I guess this is a long-winded way of saying, “ditto” and “thanks” to the whole community who made this success possible and repeatable.